I am not the only member of the classic-film-loving community in Los Angeles who noticed that LA Weekly’s cover story, “The Death of Film,” ran the very same day as the start of the TCM Classic Film Festival. The content of the story was nothing new - studios are switching over to digital-only distribution whether exhibitors (who have to pay exorbitant fees to upgrade equipment) or audiences (who will lose a great many theaters as a result) want it or not. Beyond the financial reaming that is taking place is a reaming of a different kind - a virtual war on the history of film, the very history that the TCM Film Festival so successfully upholds and emboldens. 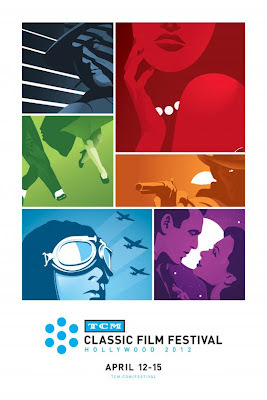 Since its first year in 2010, TCM Fest has dedicated four days each April to giving cinephiles the world over (I am constantly amazed and inspired by how far people come for this) a chance to see some of the greatest movies ever made where they belong - in a theater. It’s become interesting to share my attendance of this festival and gauge reactions. Many don’t understand the appeal of a festival of old movies, many of which can be seen on DVD and Blu-ray, while others almost reflexively ask, “how can I get tickets?” Luckily, there are enough of the latter to not only keep this thing going, but make it a bona fide mainstream success. This is only its third year, and already the festival has grown by leaps and bounds, selling out its top-level passes in a matter of hours and drawing enormous crowds on Hollywood Boulevard. They broke attendance records at Grauman’s Chinese Theatre with their showing of Chinatown, and had to turn away passholders, never mind eager standby lines, from several screenings (those films were eventually shown again in the slots reserved for encores of popular programs on the final day). By the festival’s close, TCM not only announced plans to return next year, but that they now consider the festival a regular annual event. But one wonders how similar the festival will be, not only five years from now but even next year. With studios intent on shutting down celluloid distribution, will we be able to enjoy three theaters dedicated solely to 35mm projection, as we were treated to this year? Will we eventually reach a stage at which even the Classic Film Festival can’t show films as they were intended to be seen? Perhaps. But for now, we’re still able to enjoy the wonders of film, and today I want to talk about two pictures I saw that were definitely, defiantly necessitated by their formats. When I went into Girl Shy on Saturday, my reasoning was simple. I wanted to see a silent film as an urban moviegoer might have done upon its release in 1924 - projected on film, naturally (though I doubt this was a nitrate print, but we can’t have everything), and accompanied by a live orchestra. And beyond any historical curiosity, it does prove to be quite a remarkable experience. As anyone who has attended the symphony can attest, the sound of a live orchestra is unmatched by the highest of fidelities of any recorded format, and the way the sound echoes about the room and reverberates through your bones is unforgettable (it’s been years since I’ve had the pleasure, but the memory is enough to keep me aching for more). In a movie theater such as the Egyptian, with its thick carpeting and so forth, some of this is lost, certainly, but the human element remains. You really feel those bows crossing the strings. Every note hit precisely is done so right in front of you, and beyond the thrill of live music, there’s a high-wire element to a live performance of any kind. While one wouldn’t expect, or receive, any mistakes from the esteemed Robert Israel Orchestra, whose playful, buoyant score perfectly suited Lloyd’s antics, you do get one other element from a live orchestra - interpretation. Few filmmakers had the luxury of dictating musical choices, so when a film from the silent era toured from town to town, it was up to each theater’s musician to come up with something to keep the audience entertained. Often this resulted in choices made purely on the fly, and one could go several nights in a row and hear distinct pieces of music, but even in proper compositions for an orchestra, you’re hearing one person’s interpretation of another’s intent. It’s invigorating, especially for those who like to see films several times. 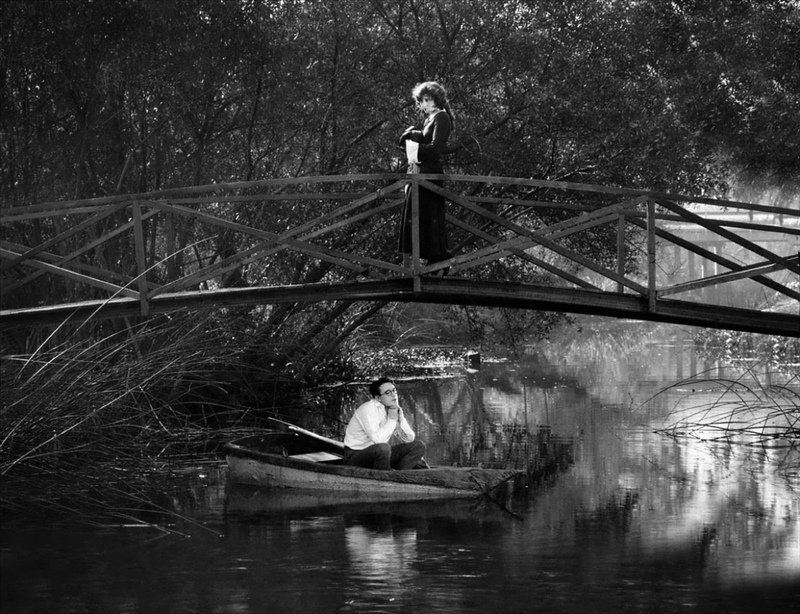 Celluloid, meanwhile, is the closest possible representation of the filmmaker’s intent for films made before the advent of digital editing, and certainly before the digital intermediate (in which every post-production element happens on a computer). These films were shot, cut, and exhibited on film from start to finish, and every decision along the way was made with the knowledge of how their on-set elements transfer onto, and through, film. Even for filmmakers not overly concerned with film as an art form, their work as craftspeople deserves to be seen in such a manner. And you know that a person is up there overseeing everything, ensuring the cinema plays flawlessly. Girl Shy is a wonderful film, exhibiting all the traits we love about Harold Lloyd. From the lovable romantic unsuccessful in love to the spectacular, physics-defying finish, this is Lloyd incarnate. We meet him as small-town tailor’s apprentice with dreams of publishing his book, The Secret to Making Love. The irony is that he’s infamously shy, unable to squeak out even modest conversation in the company of women. This all changes when he travels to Los Angeles to meet with publishers, whereupon he’s greeted to far more jeers than cheers, but when the latter come in the form of Lloyd’s lovely costar, Jobyna Ralston (as Mary, “the rich girl”), well, you can scarcely ask for more than that. As he’s able to, early and often, show his affection for her rather than speak it, it seems Harold (as he’s called in the film) has finally found his dream girl. But one thing leads to another, and before long, Harold is racing away towards Mary’s wedding to the wrong man, taking every form of transportation imaginable - anything to get even a step closer. The whole thing’s a gas, a masterpiece in the extended gag, as thrilling and emotionally involving as it is hilarious. Before the screening, Suzanne Lloyd, Harold’s granddaughter and keeper of the flame, talked about how even decades after the fact, Harold would watch one of his films on TV and talk about how he should cut a few frames here or there to tighten it up, and that perfectionist tendency definitely comes across in his films. He may not be as mechanical as Keaton, but he’s just as precise. The experience of seeing a true film live with an orchestra would only be matched, and quickly exceeded, by what awaited us Sunday morning - How the West Was Won in Cinerama. 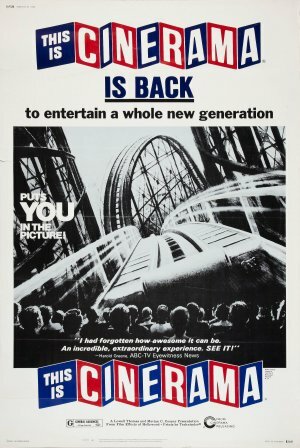 For those who don’t know, Cinerama was a laborious filming process whereby onscreen action was captured using three separate cameras to be then projected by three separate, synched projectors. The result is an extremely wide aspect ratio (roughly 2.89:1) projected onto a curved screen of almost unimaginable size. Look, I’ve been around, I’ve seen things. I’ve seen IMAX, Omnimax, several forms of 3-D, true anamorphic widescreen, 16mm, 35mm, 70mm, hand-cranked projection; I’m not saying I’ve seen it all, but if given half a chance, there’s a damn good chance I’ve been there. Cinerama was astounding. It’s unimaginable that someone could see How the West Was Won for the first time any other way and walk away feeling they’ve truly seen it. When the illusion is truly convincing, as it is surprisingly often, it’s a dizzying, enveloping experience. When it isn’t, well...you talk yourself into it. 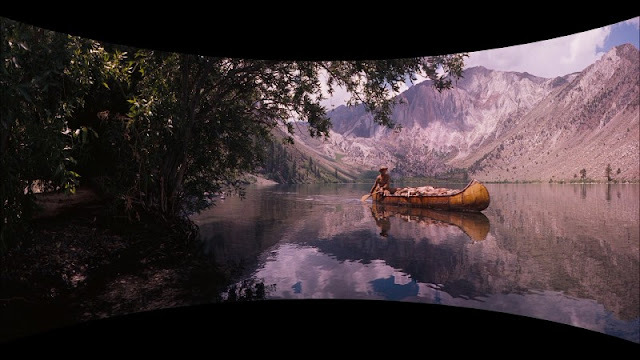 See, because the Cinerama effect is created using three synchronized projectors, you end up with two vertical lines dividing the image into thirds, making you distinctly aware of a) the illusion, and b) the blocking. The three directors who worked on this picture - John Ford, Henry Hathaway, and George Marshall - were smart enough to block their actors in distinct sections, meaning the blurring effect across each frame is relegated chiefly to the scenery. This is less effective for the film’s many you-are-there tracking shots, but the enveloping feeling is so convincing you’d only notice the way the film seems to fold in on itself if you looked for it. If nothing else, it provides a masterclass in blocking. Not a perfect representation of the spectacle, but you start to get the idea. In the theater, you'd also see two blurry vertical lines, one near the shore, another about midway through the canoe, diving up the three frames. Part of the wonder of cinema is that it is as much a groundbreaking technology as a viable artistic medium, and I’ll never quite understand those who embrace one while rejecting the other. The power of cinema is rooted in imagery, and thanks to ongoing archival efforts, Cinerama continues to provide the kind of imagery you simply cannot see anywhere else. Especially in the age of HDTVs and increasing numbers of theater chains designing auditoriums for 1.85:1 and then masking for “wider” ratios, a true widescreen image starts to feel small. But to see the curtain part...and part...and part...and part, well into one’s peripheral vision, and then to see those opening images of the west light up this unimaginably large screen that takes up your entire field of vision, and to continue to be enraptured minute after minute and hour after hour by each new unfolding vista, well...that’s CINEMA, man. There’s simply nothing like it. I couldn’t have cared less about the story, and even a cast as dynamic as this (Lee J. Cobb, Henry Fonda, Karl Malden, Agnes Moorehead, Gregory Peck, Robert Preston, Debbie Reynolds, Thelma Ritter, James Stewart Eli Wallach, John Wayne, and Richard Widmark are all in this movie, and it’s narrated by Spencer Tracy) had to work overtime to pump any life into this, but I LOVED How the West Was Won. Before the screening, a representative of TCM came out to explain what we were about to see, and give due credit to the five-man team it took to run the program (three projectionists, one sound guy, and one coordinator). Afterwards, Robert Osborne came out to speak with Debbie Reynolds, who still knows how to play to a crowd like it’s second nature. She spoke with good humor about working with Thelma Ritter, who was expectedly a great sport through the many physical demands of the production (not limited to, in her case, driving a horse-drawn wagon), and acknowledged the stunt people who lost their lives or livelihoods working on the picture. She spoke about how difficult it was acting for Cinerama, as the angle of the cameras demanded actors looked a little bit to the side of each other in order for it to look like they were facing one another onscreen. By the time it was over, I’d spent five hours in and around the Arclight’s magnificent Cinerama Dome, only about half of which was spent actually, you know, watching the film. It didn’t matter. I’d attended a unique, true, spectacular day of cinema, one that attests to the artistic imperative of seeing films on film. No digital format could attest to the raw, natural element of these wide-open spaces, nor the buoyant spectrum of colors that overtook my field of vision during the film’s detours to the war or casinos. You’d never know the size of the family’s plot of land, nor the endless length of the river, nor the spectacular canyons in the opening montage. You’d never feel the warmth of the actors’ faces against the harsh elements (and nitpickers overly concerned with how women somehow remain made-up with perfectly formed hair against all the elements will have a field day, but that’s a decidedly anti-cinematic stance I won’t abide), nor the explosive power of song and dance, or just how plain big it all - the screen, the west, your LIFE - truly is. This is Cinerama, certainly, but more potently, this is cinema. In future installments of these TCM Fest pieces, which will post exclusively to Battleship Pretension, I’ll discuss the rare screenings we were treated to, different ways women defined themselves (and were defined) in three pre-code films, three very different kinds of crime pictures, the highs and lows of the theatrical experience surrounding two films, and wrap it all up with an in-depth look at melodrama, ‘50s style, in Otto Preminger’s Bonjour Tristesse. However, the writing (and subsequent publishing) order of these will pretty much depend on my mood, so that arrangement might not stick around. I hope, however, that you will.